The City of South Gate’s commitment to economic development includes attracting, retaining and expanding the city’s business community to support job creation; stimulate an economy that grows the local tax base; and securing a competitive business climate. The city works in partnership with its business organizations such as the South Gate Chamber of Commerce, facilitating access to business incentives and programs. South Gate’s Economic Activity Report highlights the city’s major economic development accomplishments, including job creation successes, development projects, and housing and sustainability initiatives such as the “Sowing the Seeds of Sustainability”, a growing inventory of “green” projects. As early as 1922, several small industrial plants had moved to South Gate. Families moved here and needed employment close to home – businesses, factories and industry soon followed. In 2012, the city authorized expenditures of approximately $12.7 million for off-site capital improvements to support development of the $80 million, 30 acres Azalea Shopping Center, an investment to boost local sales taxes by approximately $2.5 million, a path to sustainability over the long haul and growth on the economic development front, this project is the city’s first major development deal since the State eliminated local redevelopment agencies and tax increment financing in 2012. In 2005, the former General Motors plant is environmentally remediated and used for new schools, including South East High School built by Los Angeles Unified School District to relieve congestion in existing schools South Gate. South Gate has an asset that some urban cities to not have: land that can be developed for commercial uses. Since the late 1980’s, the city has focused on strategies that would use former industrial sites to promote commercial businesses and light manufacturing. The city joined with other hub cities to form a consortium to address unemployment and job training using funds from federal Job Training Partnership Act. Several thousand jobs were created during the period between the mid 1980’s and 1990. During the 1960s, South Gate’s Firestone Boulevard was well known throughout the region for its abundance of car dealerships, most famously that of Cal Worthington, whose Worthington Dealership Group at its peak had 29 dealerships including in South Gate and Long Beach, and other western state cities. Cal Worthington and South Gate became household names due to his “dog Spot” TV commercials, which first aired in 1971. The commercials with his dog Spot which was a tiger or other exotic animal in and unshakeable jingle, “Go see Cal, go see Cal, go see Cal”. And, even though his Pete Ellis Dodge has been out of business for decades in the Southeast, people can still remember how to get to South Gate from his jingle: “Long Beach Freeway, Firestone exit, Southgate.” http://www.mydogspot.com/video.htm In the mid 1970’s, Ford and General Motors are forced to implement massive layoffs as Firestone and other manufacturers opened new plants in non-union locales like Wilson, North Carolina. Firestone closes completely after significant downsizing in 1980 when 1,300 workers are laid off and the plant closes. Shultz Steel Company, founded in 1947 by Gordon W. Shultz. In 1936, General Motors’ South Gate Assembly went into production with 1,000 employees (soon grew to 4,000) as an automobile assembly plant for Pontiac, Oldsmobile and Buick cars for sale on the west coast. It was the first GM plant to build multiple car lines, as a result of a Depression-spawned move to cut costs by sharing manufacturing. The plant was located at 2720 Tweedy Boulevard, South Gate, California. By 1949 it was producing full size cars from the Chevrolet, Pontiac, Oldsmobile, Buick and Cadillac brands. During the mid-1950s it was General Motors’ highest-output plant. When the compacts became intermediates for 1964 their production ceased at South Gate, and Chevrolet Impala full-size production was added, after the Buick-Oldsmobile-Pontiac Assembly Division was renamed GM Assembly Division (GMAD) in 1965. Slow sales and efforts to reduce air quality issues resulted in the closure of the plant, with production ending on March 23, 1982. South Gate boasted as one of the largest local industries in the area with the Firestone Tire and Rubber Company, built on a 40-acre former bean field. Firestone’s first tire rolled off the assembly line on June 15, 1928. In 1927, Henry Ford and tire maven Harvey Firestone to a trip to Los Angeles to select Locations for their new factories. Ford chose Long Beach, and suggested Firestone go to South Gate. At The time, South Gate was mostly agriculture, and Firestone found 40 acres of beanfield to house his new manufacturing plant. Architects Curlett and Beelman created the spectacular four-story Italianate complex, with its own power plant and polychrome murals by Gladding McBean depicting the tire and rubber-making process. It doubled in size a year later after the plant opened in 1928. Weiser Company Foundry, the world’s leading manufacturer of hardware by 1943, was founded in South Gate as the sole manufacturing operation in the U.S.
Citizens Against Lawsuit Abuse (CALA) is a nonpartisan grassroots movement of concerned citizens and businesses who are fighting against lawsuit abuse in California. CALA serves as a watchdog to challenge the abuse of our civil justice system and engages the public and the media to deliver the message that lawsuit abuse is alive and well in California and that all Californians are paying the price. 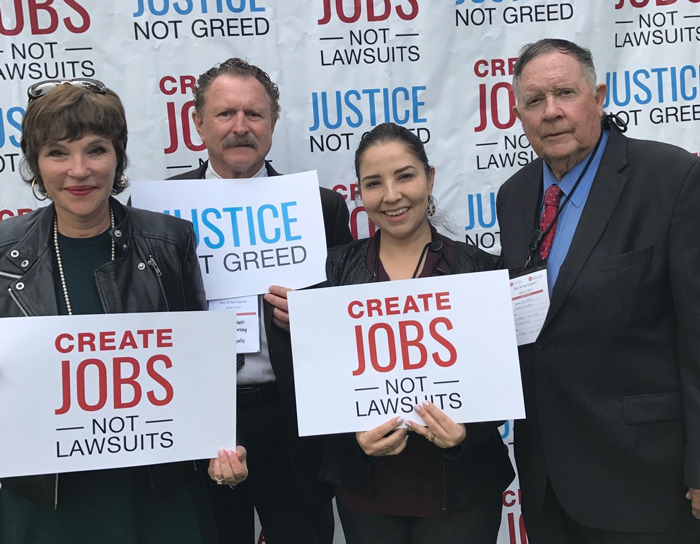 Photo from left to right: Our members Maryann Maloney from Maloney Meat Market, Jerry Brown from Mr. C’s Towing, Yvonne Chavez Former Executive Director of the South Gate Chamber of Commerce, and Former South Gate Mayor W.H. (Bill) De Witt.